A wide curving bay with golden sands. Good for swimming and snorkelling as the beach is protected by a reef. The Nilwala river has the Star Fort on the North side. Built by the Dutch in 1765, which now houses the Museum of Ancient Paintings. 3 Kilometres inland is the Purvarama Maha Raja Vihara monastery. Outside is a 39 meter high Buddha. 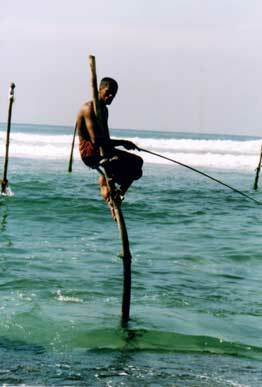 Famous for its stilt fishermen who perch on poles, which have been handed down from farther to son, to catch fish when the tide is high. Here you will find a Naval base and the colourful fishing boats in the harbour. The market place is the centre of activity for the town.